2015. március 4-én 10:00 órai kezdettel Dr. Anders M. Jorgensen (New Mexico Tech) „Modeling the Plasmasphere Dynamics with Data Assimilation” címmel tart előadást az MTA CSFK GGI előadótermében, Sopronban. 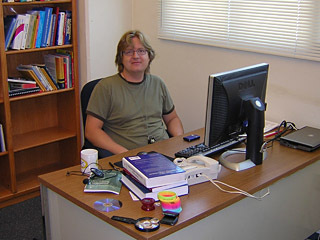 Modeling the Plasmasphere Dynamics with Data Assimilation Dr. Anders M. Jorgensen New Mexico Tech Socorro, New Mexico, USA The Earth’s plasmasphere is a region of dense plasma, originating in the ionosphere, extending nearly to geostationary orbit. The precise extent of the plasmasphere is dynamic. Knowing the exact distribution of plasma in the plasmasphere is important as an input to coupled magnetospheric models. In particular, density gradients inside the plasmasphere and at the plasmapause, are important in controlling waves which are responsible for the growth and decay of the radiation belts. At the most basic level the plasmasphere can be described in terms of plasma exchange with the ionosphere and convection due to an imposed electric field. At that level plasmasphere modeling is relatively simple. However there is currently insufficient knowledge of the drivers, particularly the electric field, to model the plasmasphere boundaries at the most accurate level to provide sufficient quality inputs to wave and radiation belt models. The solution to this problem is to use a data assimilation approach. Data assimilation wraps a feedback loop around the plasmasphere model in which free, ideally unknown, model parameters are adjusted to maximize the agreement between the model and observations. There are many possible implementations of this feedback loop. We use the Ensemble Kalman Filter in which a statistical ensemble of models tracks the observations through linear transformations. In this presentation I will discuss the plasmasphere and observations as well as some examples of data assimilation.